Sam's Club Merchant Services - Buyer Beware! Not too long ago, CardFellow posted an evaluation of Costco merchant accounts that found Costco’s service to be very disappointing. Undeterred, I decided to take a look at the merchant services offered by Sam’s Club to see if Costco’s big-box competitor fares any better. As it turns out, Sam’s Club Merchant Services uses the same bait-and-switch tactics and opaque pricing as its rival Costco. Sam’s Club has partnered with First Data to offer credit card processing services. There is nothing wrong with that, especially since First Data is the largest processor in the United States, and many companies resell First Data’s services. As I’ve outlined below, the problem is with virtually every other aspect of Sam’s Club merchant services. The first downfall of Sam’s Club merchant services or small business credit card processing service is that it uses tiered pricing. 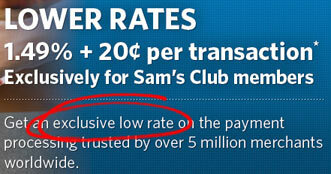 Below is a screen shot taken from the Sam’s Club Web site, where the company claims to offer “an exclusive low rate” to its members. There are three problems with this offer: the rate isn’t exclusive, the rate isn’t fully-disclosed, and the rate is too good to be true. Sam’s Club Merchant Services Exclusive Rate? Tiered pricing allows processors to circumvent interchange fees to offer whatever rates they choose. For example Costco, the closest competitor of Sam’s Club Merchant Services, is offering its members a slightly lower rate of 1.48%, but both of these rates are misleading. Sam’s Club is luring customers to its merchant services by offering a 1.49% processing rate that is too good to be true. As we can see from the following screen shot taken from a Sam’s Club Merchant Payment Processing flyer, the 1.49% rate only applies to certain transactions. We must contact a representative to learn about additional undisclosed rates. As directed by the fine print, I contacted Sam’s Club via live chat to inquire about additional rates and fees. A transcript of the conversation is below. The content of the conversation has not been edited, and only the representative’s name has been changed. Where can I find information regarding non-qualified rates? I manage an auto parts store. ok so you will be doing face to face processing w/ avg ticket below $340 correct? By the way, my name is (snip). You may want to jot down my contact info for future reference. I will be your Account Executive going forward: (snip). I’d rather just learn about your rates. no prob, in order to create a record and obtain those rates, I have to save our conversation for future reference. can you atleast provide a business name to save things under? According to the Sam’s Club representative, the surcharge for non-qualified transactions costs 1.49%. That means that Sam’s Club will charge any credit card transaction that it considers “non-qualified” at a rate of 2.98%. (1.49% qualified + 1.49% non-qualified). There is a big difference between the 1.49% rate that Sam’s Club Merchant Services advertises, and the 2.98% rate that they actually charge on many transactions. The absolute lowest traditional interchange rate that Visa currently charges is 1.51% for basic consumer credit card transactions. Sam’s Club Merchant Services has no choice but to consider the majority of transactions non-qualified or the company stands to lose money on every merchant account it issues. That means that you’ll pay more and Sam’s Club will make more. Both Sam’s Club and First Data make quite a bit of money at the expense of small businesses by leasing credit card processing equipment. Leases are frowned upon here at CardFellow because they are expensive and offer little benefit to businesses. In fact, processors in our marketplace sign a legal agreement that specifically bans the practice of leasing equipment. My conversation with the Sam’s Club sales representative proves that leasing is not in a business’s best interest. Sam’s Club would be providing a much better service for its members by advising them to purchase equipment rather than leasing. My live chat with the Sam’s Club representative picks back up with equipment information. The machine and pin pad can be leased for $33.79/month. When leasing, the equipment is under full warranty for 48 months and tax deductible annually. There are two very big problems with Sam’s Club pushing equipment leases. The first and most obvious issue is cost. The representative said the cost to lease a machine and PIN pad is $33.79 a month for 48-months. That’s a total cost $1,621.92 for equipment that processors regularly offer in CardFellow’s marketplace for just $195 (terminal & PIN pad). That’s a difference of $1,426.92! The second problem with Sam’s Club lease is that the company is offering proprietary equipment that only operates on First Data’s network. Any business that leases equipment from Sam’s Club will be stuck processing with First Data for the duration of the four-year lease term. The only other option is to buy new equipment that is compatible with another processor while still paying Sam’s Club and First Data a monthly lease payment of $33.79 for equipment that is not being used. The final pitfall of Sam’s Club merchant services is the three-year contract term and $90 cancellation. Sam’s Club does not disclose the cancellation fee on its Web site. It wasn’t until I specifically asked about a merchant account cancellation fee in the following conversation via live chat that I was told about the $90 penalty. What is the contract term and early termination penalty? The agreement 36 months, $90 cancellation fee. The trail (supposed to read: trial) lets you cancel under 90 days without the cancellation fee. I didn’t get a chance to ask, how soon are you looking to be up and running? Sam’s Club is a great place to buy bulk groceries, but the company offers poor credit card processing services. You will be much better off using a service like CardFellow to get instant, competitive quotes that are based on interchange plus pricing, and that don’t have cancellation fees or equipment leases. Costco Credit Card Processing = A Big Mistake! Intuit Credit Card Processing = Very Expensive! Sam’s Club / First Data Global Leasing is a scam!!! Nightmare experience! When shopping for a credit card processor be sure they loan you the terminal at no extra expense. Also demand $0 cancellation Fees. We currently process through Evo for less than half of Sam’s Club. DO NOT INCLUDE YOUR BANKING ROUTING & CHECKING NUMBERS ON YOUR FIRST DATA APPLICATION!!! I’ve spent over 5 hours on 12 different phone calls trying to get the unauthorized charges returned to my corp checking account…. and still no refund.. I was charged $99 for the POS equipment that they agree they never sent me. (Since we don’t accept credit cards directly from clients there is no need for equipment) I was also charged a $25 monthly service fee even though in every emailed communication from them it states no monthly fees and in a couple of emails from me to them, I confirm that there will be no monthly fees. As a last resort, I contacted the sales representative that set up our account and he accused me of altering his emails that confirm that there would be no monthly charges or fees. One of the worst “vendor” situations I’ve been involved in in many years. I didn’t see the horrible reviews of First Data until after I submitted the application, but as soon as I did see them, I cancelled the service without processing a single transaction with them. I recenlty had a conversation with one First Data representative and I’m glad I asked plenty of questions similar to the questions displayed in the conversation above. I came across many complaints about this company and its leasing protocols. They fit every aspect of a scam by definition. They encourage you to do the leasing rather than purchasing the equipment — That is because if you do the lease they make you subject of a non-cancellable 48 month lease. Should you decide to break the agreement they will harass you and make non-stop calls to obtain their part of the agreement. I am lucky I did my research as well as having had close friends who experienced such unfortunate situations with this company. I should add that most numbers or representatives put you on hold for the many times you try to reach a person to speak to. I personally wouldn’t encourage to submit any applications for their services. Look for other reputable credit card processing companies. I contacted Sam’s Club Merchant services after purchasing a Royal cash register at Sam’s Club. I applied and had an account set up through First Data and the sales rep told me I could purchase a Data Cap processing machine on Ebay. I found one and purchased the unit for $365 used. Once I received the unit in the mail and called to have it activated I was informed it could not be activated, that I had to rent a unit. After repeated calls to that Sales Rep he eventually just stopped returning my calls. I never received a unit to process card payments rent, used or new. My merchant account was activated and I was charged monthly for an account I had no way of using. My bank statement will normally have a number to call the company making the charge to my account. These charges had no phone number to call and the only contact number I had was the Sales Rep that was no longer returning my calls. When I finally found the correct number to call, which the internet had many that were no longer in service, my account was finally closed today I hope. I was informed I could not be reimbursed for the monthly charges for an account I had no access to. I was told I had not called before the day I actually had someone on the phone and for the third time today I was disconnected. I do not know if they intend to charge my account again but at this time I am out $500 and never, not one time had a processing unit to use the account. Sam’s/ First Data merchant services seems to fit every description of a SCAM!!! I’m sorry to hear of your frustrations. If you’re still looking for a merchant account and equipment to allow you to process credit cards, I highly recommend signing up for our free service here at CardFellow. The processors we work with sign legal agreements that stipulate what they can and can’t do, which helps us advocate for and protect businesses like yours. Additionally, we stick around as another level of customer service in the unlikely event that you have a problem with your processor. You’ll find the process of accepting cards much less stressful if you go through an unbiased service like ours. Let me know if you have any questions or would like more information. I am the same bad situation with Sam’s Club. When I try to get information from them, they put me on lease for 3 years even though I already have a contact with another bank. I try to contact Sam’s Club and they gave me so many departments to talk with and no one takes responsibility at all. So be careful for anything to deal with Sam’s Club. I no longer processing with Sam’s having ended two months ago and now they want to charge me $200.00 in processing fees for a month that we did no processing with them. Their machine was sent back to their FDGL leasing company to boot and the account was supposed to have been closed. The saleslady promised no early termination fees. She lied. Not only that we found out she signed us up for a four year contract with First Data Global Leasing for the machine. We had no idea. Not only that they took money from an account they were not authorized to do so. The FTC has been contacted. Go to FTC.gov! ! Same bad experience with them. They leased me a point of sale system and told me it was perfect for my food truck. After it arrived, the system is for a restaurant and way too big for my truck and I have been getting the run around for months now. They are trying to force me to purchase their new system as a replacement. They are also holding almost $2000.00 of my transactions as payment for the system they sent me that will not work. Customer service is the worst they have been giving me the run around for months. Do not use them. I agree completely with the statements above. I wish I would have seen some of the reviews before I tried it. Sam’s Club uses sneaky pricing and billing with many hidden charges. This has been a nightmare that I have been fighting for over a year. It is impossible to cancel. Sam’s Club sent me a letter telling me where to send back the credit card machine that I never used. I had it tracked, and they refused to accept it 3 times. Now it’s lost in post office somewhere and they are trying to charge me $700. I refuse to pay. I can back up every detail with a paper trail. This has really been a mess, and I refuse to pay for this scam. I wish I knew who in Sam’s upper management to contact. This is not right! I’ve been a loyal Sam’s Club member, but not anymore. Yes! so true, I can’t even explain how much they have robbed me and how many times and I’m STILL dealing with it. I wish I wouldn’t have gone with them, the sales man lied to me too, BIG TIME and I’m still paying for it to this day. Canceling with them is a joke. I’m still being charged, they will tell you on the phone that a credit is on it’s way when in fact you will just be billed again the next month! On top of paying the stupid PCI charge on each account even though you are compliant AND CANCELLED!! It’s insane. IT’S NOT WORTH IT. Live and learn big time for me! They say you only get charged 1.80%, but in reality it can be much much more. It turns out I was paying 3.95%. I found another company for half the price. Closing the account is a pain. Then they make you reopen it to get paid for transactions that happened before you closed it. They were ripping me off just like the last company. I didn’t last a year with Sam’s Club. Now they have taken their fees from my account, but won’t deposit my last $909.00 transaction until they review it. It’s been 2 weeks now and they say it may be another 10 days! Sam’s Club is a real ripoff! Now I will close my Sams Club shopping card, too. Okay, so who should we use for our merchant services? The easiest way to find the most competitive credit card processor is to sign up here at CardFellow to receive instant quotes from as many as six different processors. Processors must abide by CardFellow’s terms in order to compete in our marketplace, and our terms exist to protect our clients and ensure that only competitive, honest quotes are offered. CardFellow also remains for support after you choose a processor to ensure pricing is locked for life, and that the processor continues to offer exceptional service. I have a deli and shop at Sam’s every day. And every day the merchant services salesman pushes how much money they will save if I use their credit card processing. I signed up with Sam’s Club credit card processing in January 2013, and the salesman guaranteed I would save money. I was told that I could cancel within 90 days if I wasn’t satisfied. This was the salesman’s pitch to me before I signed up. I figured it couldn’t be too bad with all the guarantees, and I decided to give it a try. Well, things were bad from the moment I got my first statement. I called the salesman that set up my account for assistance, but he’s no longer with Sam’s. January 2013: My credit card sales were $8,000, and I was charged processing fees of $520 plus $39.95 for the lease through another company. That’s 6.99% of volume as a credit card processing fee, which is over 2.74% more than my previous credit card processing company. February 2013: My credit card sales were $10,000, and I was charged processing fees of $650 plus the $39.95 lease. That’s 6.89% of volume as a credit card processing fee, which is over 2.64% more than my previous credit card processing company. March 2013: My credit card sales were $12,000, and I was charged processing fees of $780 plus the $39.95 lease. That’s 6.83% of volume as a credit card processing fee, which is over 2.58% more than my previous credit card processing company. I pulled the plug in April and went back to my old credit card processing company. When I called Sam’s to close the account I was told the credit card machine lease was with another company, so I needed to call them to arrange a buy-back. I called the leasing company and was told I had a contract for 4 years, and I could not get out of the agreement unless I paid a $150 early cancellation fee. I told them about the 90-day trial period the salesman promised, but they said no such thing exists. I’m still working on returning the credit card machine. Sam’s took out $245 plus $39.95 for the lease in May, too. I called to inquire about the charges, and I was told they were for interchange fees. I was also told that I may have more charges in June and July. Well, I guess I got screwed big time. Sam’s didn’t save me a penny, and as a matter of fact, robbed me blind. I’m still in process of returning the credit card machine so they won’t charge me every month. I’m still in process of figuring out what charges to expect in June and July. I’m still in process of figuring out a collection notice I received today (May 15, 2013) for $140 from Sam’s Credit Card Processing Department. Do not use Sams Club credit card processing. They will not save you money. They will take your hard earned money and give you a lot of headaches. Lots of fees, I only did about $6000 in CC volume last year and paid about 8% in fees. This doesn’t include my PCI compliance fee! I initiated the service through Sams Club, I expected lower fees. Used Sam’s club for my credit card processing but was forced out of business by Walmart buying the land from the shopping center owner and they did indeed add insult to injury by charging the $90.00 early termination fee. So not only do I lose the family business, but they caused the early termination and charge me for it! I also found that switching to Sam’s did not save the money they stated it would for the reasons stated above. Buyer beware! These people are very deceptive. I cancelled my account within the 1st 30 days when I saw what the terminal leasing and terminal insurance fees added up to. Sent the terminal back after several calls to get them to send a “call tag”. Now 3 months later they deduct another $150 from my account for so called “equipment return fees”. So much for no cancellation fees in the 1st 90 days. DO NOT DEAL WITH SAM’S MERCHANT CARD PROCESSING! Good information, just wish I had it in hand before signing with merchant services. My termination fees are a lot higher then 90 bucks. The only good thing about their equipment is I got the FD200 which takes checks. The number of bad checks it has saved me from having to chase down payment for kind of ballanced it out.